Builds on the original to make a more satisfying murder mystery experience. Gameplay might seem a little overwhelming if you haven't played the first game. Hajime Hinata is delighted to be starting at Hope’s Peak Academy, the school for exceptionally gifted students. What he wasn’t expecting was to suddenly find himself on an uninhabited island with fifteen classmates and a talking stuffed rabbit named Usami. Usami claims they are all there to have fun and get along, but just as Hajime starts to relax, she is usurped by Monokuma, the talking stuffed bear from the original Danganronpa. Monokuma seems to be up to his old tricks again, and he isn’t going to let anyone off the island until someone literally gets away with murder! 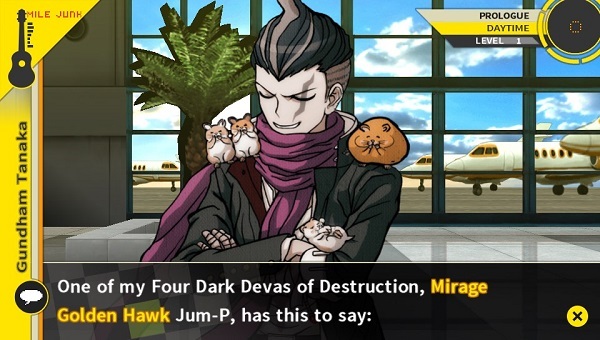 Can Hajime and the others survive Monokuma’s deadly games? Hot on the heels of the original Danganronpa, Danganronpa 2 has finally made it over to Western shores, and from the start, it’s clear that this title offers more of the same. 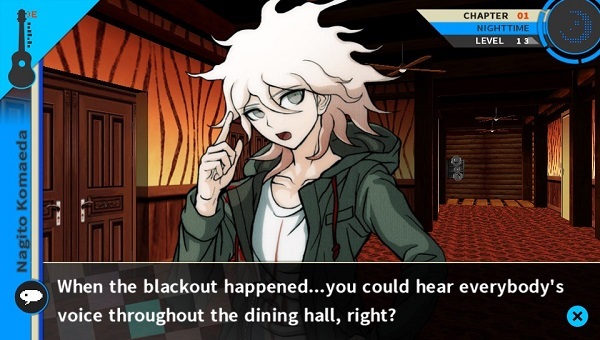 As before, gameplay is split into two halves – Daily Life, where Hajime can spend his days befriending his classmates, and Deadly Life, where a death amongst the students leads to the inevitable murder investigation and Class Trial. If you’ve played the first game, you’ll know exactly what to expect, although this time around the flow of the story feels a little more polished. Small tweaks like slightly easier navigation around maps and bonus sidequests like finding hidden Monokumas all contribute to a more enjoyable gameplay experience. The biggest changes, however, are during the logic games of the Class Trials, and it’s here that it feels like almost too many bells and whistles have been added. Where the first game at least eased you in gently, here even the first case feels quite full on, with all kinds of options and puzzles thrown at you one after the other. In debates, you no longer just object to people’s arguments – you can also back them with the evidence you’ve gathered. You’ll have to refute individual arguments and assemble crucial words from letters that fly across the screen. And even the very first case has so many twists and turns that, just as you think you’re on the verge of uncovering the truth, you’ll find yourself heading in a whole new direction. If you like murder mysteries and Phoenix Wright style gameplay, there’s plenty of content here for you, but there are times when it can feel a bit full on and you just want to step back for a quick break. To avoid spoilers, we can’t talk about anything after Chapter 1 in this review, but rest assured that even at that early point, with sixteen characters and two sentient stuffed animals on the island, there is plenty going on, with the promise of much still to be revealed. As with the original, dialogue sections can feel a little slow when every character has to weigh in with an opinion, but at least the cast is eclectic enough to be quite an interesting bunch. Visually, Danganronpa 2 is much the same as the original, with a mix of 3D areas to walk around and 2D locations with character and object sprites to investigate. Once again, character designs are detailed and stylish, and whilst the 3D areas are a bit bland, the level of attention given to the 2D areas more than makes up for it. The background music is appropriate if not especially memorable, and veterans of the first game will no doubt immediately recognise all of Monokuma’s creepy sound effects and themes. Whilst it’s probably not best to jump straight into the series with this game, if you enjoyed the first Danganronpa, then this sequel will offer a slightly more polished version of the same. If you want a murder-mystery replete with twists and packed with logic puzzles, then you won’t go far wrong with this title.